BIG AND BRASH, MALAYSIAN CONSTRUCTION tycoon Ting Pek Khiing bulldozed his way to get where he is. Ten years ago, he was just a small contractor in a small town. Now, he heads a group of companies that lists on their books such projects as an $8-billion industrial park in Bintulu, Sarawak, hotels in China, infrastructure in Iran and resorts in the Philippines. Its order book adds up to $18 billion over 13 years -- almost as much as global giants like Bechtel. But the charge-ahead Ting has run into a financing quagmire that threatens to pull him down, along with the empire that he built. At the heart of his problems: the Bakun hydroelectric dam project that his flagship company, Ekran, is co-ordinating. More specifically, its 32% stake in Bakun Hydroelectric Corp. (BHC), the joint venture set up to finance, build and operate the dam. To fund its portion of the $1.1 billion required for BHC's phase one, Ekran last month made a one-for-one rights issue of 257.1 million shares. The exercise turned out to be a dismal failure. It was undersubscribed -- an almost unheard of occurrence in Kuala Lumpur's go-go market -- and by a massive 63%. In short: shareholders had little confidence in what the company was trying to do. Though not entirely a surprise, the poor take-up gave the Malaysian bourse an attack of the jitters -- and set international investors worrying over its effect on other infrastructure projects, new listings and funding exercises. Perhaps with the benefit of hindsight, analysts say Ting bit off more than he could chew. There was such negative sentiment in the weeks before the deadline that underwriting banks extracted a promise from Ting that he would help out if the bid flopped. When it did, he bought 151 million of the unsubscribed shares at a cost of $342 million. This brings his personal stake in Ekran from 26% to 55.7%. So rather than help fund the Bakun project, the rights issue has become a drain on his finances. Ting will now need to fork out a total of $500 million -- more than double the amount he intended to spend on the $6.2 billion dam. The 52-year-old tycoon responded to the blow with bravado. "I was not disappointed with the undersubscribed issue because Ekran already has the money," he says. He might have added: but not without major restructuring. Just months after scoffing at the idea, Ting is planning to inject several of his listed assets into Ekran, turning it into a holding company. The companies include electrical-wiring-accessories-maker PWE Industries (56% controlled by Ting and his wife), Pacific Chemicals (22%) and Granite Industries (36%). Pacific Chemicals, despite its name, deals in timber, while Granite is an investment holding company. Ting explains the change-of-heart as a way for Ekran to "diversify and generate income for the next five to six years before BHC is profitable." But how he financed the half-billion-dollar rights issue is a sore point with Ting. "We have the way. It's very rude to ask me where I got it from. It's my private matter," he says. Analysts believe the sum was cobbled together from bank loans, using his shares in listed companies as collateral. "The big concern now is Ting's own high gearing and whether he would have a decent stream of income from Ekran to service his personal debts," says one Malaysian merchant banker. Analysts say Ting's personal debts total more than $1 billion. The Ekran chairman may need to sell shares to reduce borrowing. Ting's financing woes aside, the rights-issue flop points to a crucial problem -- public perceptions of the Bakun project, which is linked to Ekran's own prospects. And the view from investors is a distinctly unenthusiastic one. Ting needs a sweetener to make BHC's public offering this month a success. Which is probably why he called off another rights issue proposed for next year. (Besides the 25% stake to be held by the public, ownership of BHC is shared with various government and state organizations.) But that will leave the dam builders short of $1.2 billion by next May. To make up the deficit, Ting says he has lined up "other instruments" -- most likely some form of bonds. This will be more expensive, adding to costs. Another option may be to dispose of Ekran assets as part of a bailout or to bring in outside shareholders. Earlier, Kuala Lumpur was abuzz with rumors that the powerful Renong group headed by Halim Saad would act as white knight, buying Ekran affiliate Wembley Industries Holdings or taking a stake in Ekran. That brought a rare and vehement denial by media-shy Halim. The Bakun dam is not the biggest of Ting's undertakings. In the prestige and credibility stakes, though, the mega-project certainly dwarfs all that he does -- as do the problems associated with it. The dam attracted controversy almost from the start, given its high cost, its impact on the environment and the thousands of indigenous people who will have to be resettled. Preliminary work has been dogged by rumors of disasters -- six people allegedly died when a diversion tunnel crumbled -- which Ting and the lead contractor, Asea Brown Boveri, have denied. More recently, a temporary dam collapsed. Many financiers also find the projected 12% rate of return low for such a steep investment. That there will be no revenue until the dam starts operating in 2002 is another disincentive. But for all the setbacks, few think that the dam itself is in jeopardy. "Bakun will be built whatever happens -- with or without Ting," says Yeoh Keat Seng of Smith Zain Securities in Malaysia. Certainly, there is a lot at stake, not least of which is national pride. The government has declared Bakun a "national project" and Prime Minister Mahathir Mohamad has said repeatedly that it will be built and on time. Ting, too, is unlikely to sink -- thanks to powerful friends. He is a close confidant and business partner of Taib Mahmud, chief minister of Sarawak, where he has huge timber concessions. 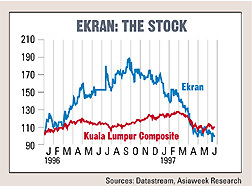 Two of Taib's sons are shareholders in Ekran. Moreover, Ting has the support of the PM, whom he has impressed with his ability to get things done speedily. The biggest impact of the failed Ekran issue is on the investment banking climate and capital markets in Malaysia. "In the past, underwriting was a freebie because initial public offerings and rights issues in the country were always fully subscribed," says Yeoh. "Ekran has shown that a big rights issue can collapse because of price, sentiment or whatever." The fiasco has definitely dulled some investors' appetites for Malaysian infrastructure stocks and IPOs. "The returns are getting thinner and they certainly don't cover the inherent risks," says a Hong Kong fund manager. "I will be wary of these tall Malaysian infrastructure stories from now on." Until recently, big projects in the country have been financed through bank loans or convertible bonds. But the rules were amended last year to allow new infrastructure projects to be listed before they are built so as to fund them entirely through equity. At least three such developments have been listed under the new rule. The Bakun IPO this month could prove a turning point. Several other listings, including new telecommunications companies Binariang and Time Telekom, have been delayed due to the dampened sentiments. But Yeoh does not believe the gloom will spill over to new IPOs: "In Malaysia, investors still believe they can make money from new listings 99% of the time. The risk is low and upside is high." Nevertheless, he warns: "Investors will be a lot more cautious and pricing will have to be attractive." For his part, Ting may find the most useful skill to be learned in the Bakun project is damage control. Financing: Initial public offering of 1.5 billion shares of Bakun Hydroelectric Corp. in late July to raise $1.2 billion. Original plan for a one-for-one rights issue next year to raise another $1.2 billion scrapped. The alternative -- bank loans and bond issues -- could be very expensive. Ownership (after IPO): Ekran, 32%; Sarawak state government, 19%; Sarawak Electricity Supply Corp., 9%; national power utility Tenaga Nasional, 5%; Malaysia's national pension fund EPF, 5%, national government investment arm Khazanah Holdings, 5%; other local investors, 15%; foreign investors, 10%.